With gas prices continuing to drop and the calendar turning to fall, it’s tempting to think about a fun fall vacation in a new RV. Maybe you have an RV now that doesn’t suit your needs anymore, and would like to trade it in. Or perhaps you would like to obtain financing for a new RV, or maybe you’d like to get a used RV at a great price. 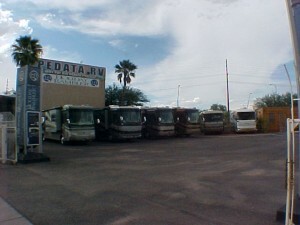 You can do all of these things when you buy your RV from PedataRVCenter.com, the leader in online RV sales. Get ready to smell the crisp air, become enchanted with the fall colors, and stand in awe at all the sights you’ll see on your fall trip. We can help you get on the road fast because we offer so many different RVs in our inventory; you’re sure to find one you’ll love. Did you know that you’ll find top models in every RV class at Pedata RV Center? We have them all: Diesel Pushers, Gas Class A RVs, Class A Toyhauler RVs, Class B RVs, Class C RVs and many more. We offer the programs you want to make purchasing an RV easy. These include our Fly n Buy Program which offers up to $500 off your airfare when you come to our Tucson showroom to buy your RV. We’re so sure you’ll find the best vehicles at the lowest prices, we’re willing to pay that partial subsidy of your airfare, and trust us; it’ll be worth the trip out to see us! You can avoid what we call the ‘$10,000 mistake’, which is spending much more than you have to on an RV that you buy in your city, versus a top-of-the-line model from our handpicked inventory. Here’s another example: Suppose you live in New England and you’re looking forward to taking a fall tour to see all the changing colors throughout Connecticut, Massachusetts, New Hampshire, Vermont and Maine. Now that’s an ambitious trip, and it sounds fun too. Pedata RV Center can ensure you take that trip in a reliable RV, as we offer a free 3 month/3,000 mile Warranty on all of our RVs, 15 years old or newer. That’s a terrific warranty that will provide peace of mind as you wend your way across the Northeast! Are you ready to choose your new RV? All the models in our inventory are in exceptional condition, waiting for new owners! Before you make a final selection, try our new Virtual RV tours! You can schedule one of these tours with us and see exactly what a coach looks like — it’s just like being at the dealership, and it will give you an excellent idea about the RV’s condition and features. You can zoom and pan the camera from your computer as a Pedata representative answers all of your questions. You might be wondering — I’d love a new RV from Pedata, but what about financing? You can start the pre-approval process with us now and obtain all the benefits of financing your RV. Keep your money invested and let our easy financing help you buy the RV you have your eye on. Financing lets you get your RV now instead of waiting, and you can take advantage of tax write-offs that may be applicable. And of course the best reason to finance with us: You won’t get a better deal on a quality RV anywhere, so it makes sense to buy it from a company that has satisfied RV owners across the country for years. Our customers offer so many stories about how much they love their Pedata RVs. You can join them! Fall is a beautiful, but fleeting time. Your fall trip awaits! Let us know how we can help you by calling 888-545-8314. Pedata RV Center wants you to take that special fall trip this year! Here’s a tip: Once you buy your RV from Pedata, why not visit some of these great destinations U.S. News & World Report recommends for fall vacations!